Aircrete Europe is the technology and solution partner for AAC panels and blocks production. We design and deliver the most innovative turn-key AAC plants and cutting-edge plant technology around the world. Being the long-term, exclusive project partner for our customers, we guide you through all the steps of planning, building and operating your AAC factory. We are a full technology partner not just a machine supplier and this results in a far higher value service for our customers. Our organization constantly invests in innovation and process technology to optimize the production process and product quality. A dedicated team of production managers, mechanics, operators, chemists, mechanical, electrical & software engineers as well as business developers is ready to share their in-depth expertise covering the entire AAC value chain. We also have a profound experience with upgrading and refurbishing many different plant technologies such as Hebel, Stema, Siporex, Durox, Ytong, Tilt-Cake versions and other systems. 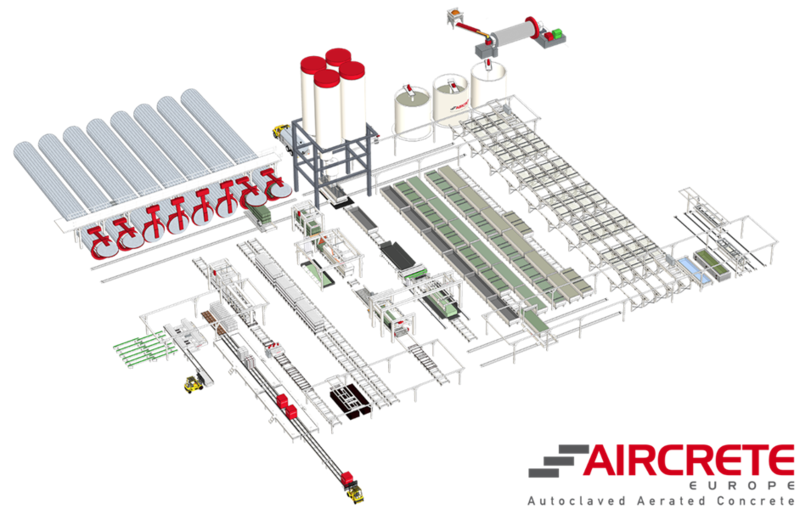 Aircrete Europe has a unique position in the industry by operating its own AAC plants. This operational and financial involvement creates the alignment of interest our customers are looking for, particularly in the ramp-up phase of a new factory.